What are the 4 things most entrepreneurs wish they could have, but can’t afford: A receptionist to professionally answer those busy phones, a secretary to type proposals, a prestigious address, and location to impress their clients and conduct business meetings? These wishes are a reality at First Choice. The best part is, you pay for these services on an a la carte basis. Check out our competitive virtual office pricing. 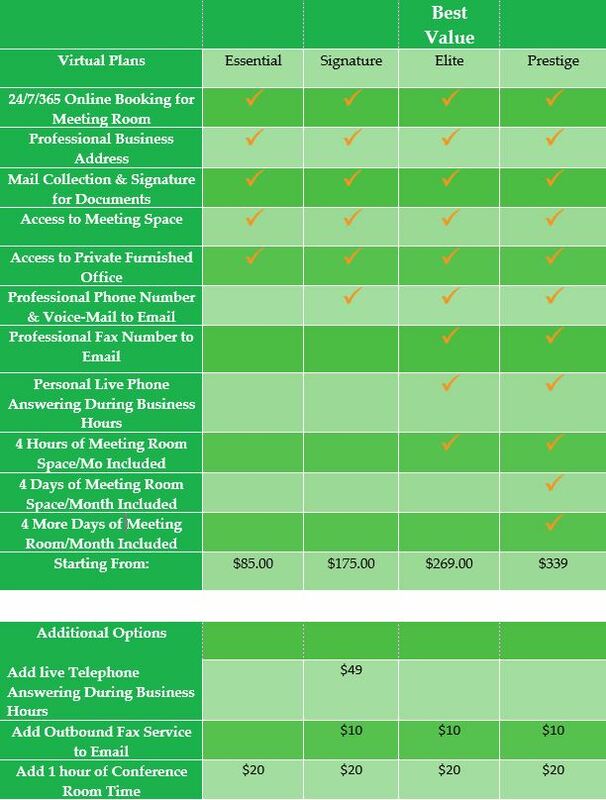 Need a Day Office or Meeting Room in another city or country? We can do that, too! Just purchase a plan that is right for you and we’ll have you up and running in 24 business hours. Home is a perfect place to start a new business or to grow your existing business. Home, may not be the best place to meet your clients. Also, as your business seeks to create a presence online, a permanent professional business address will help Google locate your company and help your search engine presence. First Choice’s flexible virtual plans allow small business to have that big business feel. First Choice is here to help your business grow. Whether you need a personal assistant, someone to answer your phones or a professional business address, we’ve got you covered. Contact us today to get your virtual office up and running. Spector Foerst & Associates, Jim Foerst, Esq.